Booed at Cannes, Harvey Weinstein washing his hands of it, numerous edits and a critical mauling. It’s safe to say I didn’t go into Grace of Monaco with the highest of hopes. It seems nor is anyone else, I watched this on an EE Wednesday and despite queuing for a good 15 minutes to get my ticket, I counted around 20 people in the screening. If I’m honest, I was hoping for a laughably bad kind of film, something along the lines of Snakes on a Plane or Sharknado whereby everyone recognises that the film is terrible, but you still have fun watching it. Sadly, Grace of Monaco was not one of these. 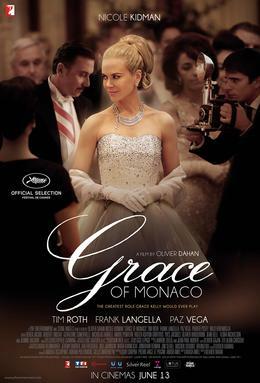 The film begins with Nicole Kidman’s Grace Kelly leaving a glittering Hollywood career for a life as the Princess of French principality, Monaco, with her husband Prince Rainier, played with zero enthusiasm by Tim Roth. The plot centres on a dispute between Monaco and Charles DeGaulle’s France, with De Gaulle purportedly threatening to ‘invade’ Monaco unless they start paying taxes to the French government. The film wants you to be on Team Monaco, but unfortunately I simply can’t get on board with rooting for a pompous, rich aristocracy who think that it’s their right to not put back into a system they are happy to take from and who feel it’s appropriate to be dripping in diamonds when attending a Red Cross fundraiser. Is there anything worse than rich people moaning about being rich? I wouldn’t consider myself a raging socialist but this film made me want to raise the red flag from my rooftop and send the tanks into Monte Carlo myself. Along with a preposterous plot that has Grace Kelly change DeGaulle’s mind by giving him a winning smile and telling a story about how hard her life has been (you’re an Oscar winning actress, living in a palace in a tax-free haven, love), the directing is awful too. Olivier Dahan seems to think extreme close ups of Nicole Kidman give weight and emotion. This may be the case if used sparingly, but Dahan uses them almost every time she speaks. His use of exposition in the script is cringingly obvious at times. This is a director who has made an Oscar-winning film in La Vie en Rose, yet his storytelling is amateur. With each excruciating line I wondered what on earth possessed Nicola Kidman to sign on to this, a couple of months’ holiday on the French Riviera perhaps? And don’t get me started on the portrayal of Hitchcock in the film, perhaps the single worst acting performance I’ve seen in a cinema. Roger Ashton-Griffiths, hang your head. Overall, a truly taxing 103 minutes, the irony of which I’m sure would be lost on poor Gracie.